Thanks to TLC Book Tours, and in celebration of the release of the tenth book in the Maisie Dobbs mystery series, we're pleased to present a review for the series' ninth book, Elegy for Eddie, by Jacqueline Winspear. Make sure to check out the rest of the tour stops for reviews of all ten books in the series! In this latest entry in Jacqueline Winspear's acclaimed, bestselling mystery series--"less whodunits than why-dunits, more P.D. James than Agatha Christie" (USA Today)--Maisie Dobbs takes on her most personal case yet, a twisting investigation into the brutal killing of a street peddler that will take her from the working-class neighborhoods of her childhood into London's highest circles of power. Perfect for fans of A Lesson in Secrets, The Mapping of Love and Death, or other Maisie Dobbs mysteries--and an ideal place for new readers to enter the series--Elegy for Eddie is an incomparable work of intrigue and ingenuity, full of intimate descriptions and beautifully painted scenes from between the World Wars, from one of the most highly acclaimed masters of mystery, Jacqueline Winspear. 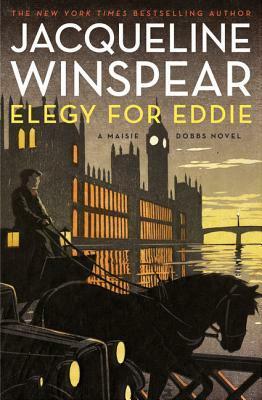 Elegy for Eddie, set in the early 1930s, follows private investigator Maisie Dobbs as she tries to unravel the seemingly accidental death of Eddie Pettit, a gentle man who took care of horses and did random tasks for factor workers and men in the market from time to time. Being a mystery novel, of course, his death is anything but accidental and Maisie finds herself involved in a complex inquiry that touches closer to home than she'd first thought. Like many mystery novels, this is a more recent entry in a series, however, it's perfectly easy to get into without having read any of the previous novels. For the most part, the reader gets enough information on Maisie and her past that even the recurring characters seem familiar from the very start. So it's easy to jump into the action as Maisie investigates Eddie's death, navigates her own personal life, and deals with the way the investigation bleeds over into her own world. Maisie is an interesting, although not always entirely sympathetic, character. She's a woman who came from nothing to wind up with her own private investigation firm, thanks largely to an inheritance from the man who mentored her. In this book, Maisie really seems to struggle with being between two worlds -- she hasn't forgotten what it was like working as a maid in a big house, but she knows just what wealth will help her accomplish. She sometimes acts with her heart in ways that are with the best of intentions, but which aren't always well received by people for various reasons. It annoyed me because she can come off as somewhat self-righteous and a know-it-all, but fortunately these traits are addressed within the plot and her actions improve over the course of the book. The mystery itself takes lots of unexpected twists and turns and winds up in a place I hadn't expected at all. I don't think it's a spoiler to say that Eddie's death is much more complicated than even Maisie had thought. It's pretty cool to watch her as she starts to untangle the mystery, and as always, interesting to read a crime novel that doesn't take place in a contemporary setting. This book is a very clean read, with most of the violence taking place off of the page, and no profanity that I can recall. It's a fun read that manages to mix crime-solving and personal drama in equal measures. Feel free to pick up the series with this book, or go back to the beginning of the series to get a better, more rounded picture of Maisie and her friends. I've only read the first Maisie book so far ... looks like I have a lot to look forward to!